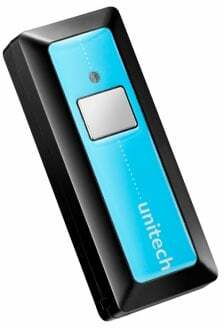 Unitech launched its ultra compact or mini barcode reader the MS910, which is being recognized as the smallest and most elegant design in its class. The MS910 is an "out of the box" data collection solution as well as a stylish accessory. It provides the convenience of wireless technology with the simplicity of a single button scanning design which makes barcode data collection simple, reliable and efficient for all users. Furthermore, the MS910 features Unitech's high speed decoder paired with an aggressive scan engine, which provides outstanding scanning performance up to 240 scans per second. Amazing barcode scanner for smart phone! A very clever device that is simple to use. I bought this tool to scan barcodes on Cisco phones. I was a little disappointed that I was not made aware that it required bluetooth connectivity. The laptop I had did not have bluetooth, so I had to purchase an additional bluetooth dongle. Overall, I really like the tool. The Unitech MS910-CUBB00-SG is also known as MS910-CUBB00-SG	or MS910CUBB00SG	.